The Bench Top Liquor Analyzer has been designed to overcome all of the issues associated with manual liquor testing, providing fast and accurate results with minimal operator involvement. 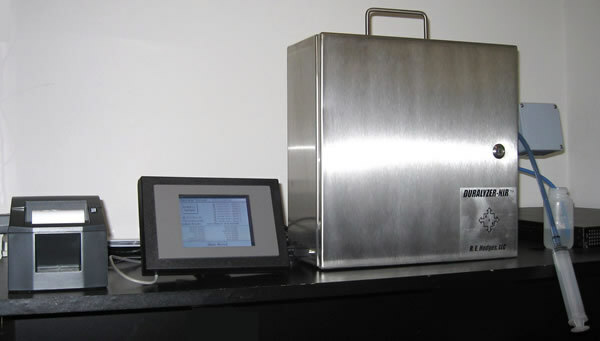 The DURALYZER-NIR bench top analyzer provides the results of the standard ABC titration test, providing effective alkali (EA), active alkali (AA) and total titrateable alkali (TTA) measurements for white and green liquors. Green Liquor RE(Reduction Efficiency) is also reported. In addition, total Dissolved solids (TDS) and total Dissolved deadload (TDD) measurements are also provided. For black liquors, residual effective alkali (REA), residual active alkali (RAA), TDO(Total Dissolved Organics) and black liquor TDS measurements are provided.​ All individual chemicals like NaOH, S%, C% and CE% are calculated, displayed on a LCD panel and printed out. The DURALYZER-NIR bench top analyzer uses the same NIR technology that is used in our online analyzers. This instrument has been designed specifically for the harsh lab environments of the pulping and recovery areas by providing many years of trouble free operation. The only required maintenance for the instrument is an annual replacement of the light source and an occasional acid cleaning of the sample holders. Manual liquor testing has to be performed routinely for quality control purposes. Lab testing is typically the only measurement procedure available for process control decisions. The tedious and cumbersome nature of the standard ABC titration test for white, green and black liquors does not lend itself well to rapid manual testing. However, the nature of this testing procedure does lend itself well to induced errors if it is not performed with care and attention. As a result, liquor testing frequency is low and potentially biased and is usually performed at most once or twice per shift. The result of this practice is that much of the process variation is missed as well as the opportunity to reduce process variations.